I'm very satisfied that I met most of my touring goals for the year. Spring - 4 day trip to the coast for ACA Bike Travel Weekend. Summer - MVBC Loop Tour in the Willowas. Then Washington and the John Wayne Pioneer Trail. Fall - Crater Lake and Ashland. Now that I am retired I plan on doing a whole lot more touring. Last winter I set some ambitious goals for the year. Here is how it worked out. Valsetz loop - Nope not yet. Did do the Cardwell Hill to Hoskins part, as well as a nice loop including Harris road. 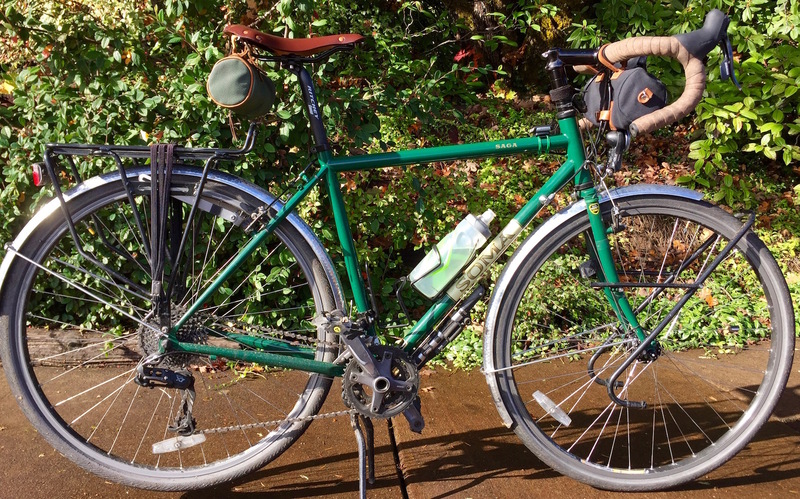 My Soma Saga touring bike sporting a new set of shiny fenders and new leather saddle. I could have at least wiped the mud off the chain stay!